The differentiation between total carbon ( TC ), organic carbon ( TOC ) and inorganic carbon ( TIC ) is important in samples like soil, sediments and waste. The IC kit is coupled with the Euro EA and allow the direct determination of the inorganic carbon and the calculation of TOC. 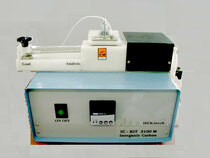 In this method the TC of the sample is measured with the Euro EA elemental analyser. For the determination of the IC the sample is weight in a ceramic boat. Then there is add acid to the sample and heated up to 100°C. The CO2 of the carbonates is transported with the carrier gas to the detector of the Euro EA and is calculated from the software as % IC. The different between total carbon and inorganic carbon is the result for organic carbon. The IC kit is integrated in the pneumatic system and use the hot wire detector of the Euro EA. With this layout it is possible to switch easily from TC to IC analysis. For the fast release of the CO2 the IC kit has a heated reaction oven.